There are two models, CP6120-D35H (Square drive version) and CP6120-D35L (spline #5 drive version) delivering a maximum torque of 4880 Nm, the lateral vibrations are extremely low. With robust streel housing and aluminium motor housing they are very durable. 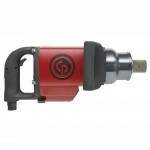 Chicago Pneumatic says designed for operator comfort and flexibility they have comfort handle, adjustable side support handle and inside /outside trigger options as the parts for this are supplied with the tool and another great feature is they can be changed to forward biased by turning the air motor cylinder around.